The Azores originated as a result of the 1766 volcanoes that are to be found in this archipelago, nine of which are still active. 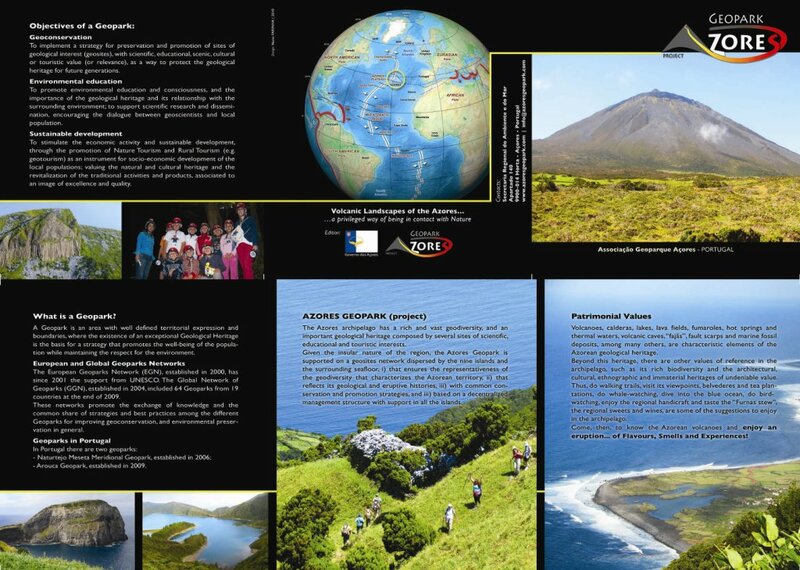 The Azores Geopark was born out of all this natural wealth, as part of the European and Global Network of Geoparks. Its aim is to promote and protect the geological heritage of the archipelago. The Azores Geopark is unique worldwide because it offers 121 geosites scattered throughout the nine islands and surrounding marine area, mirroring the vast volcanic geodiversity of the archipelago. There are nine islands, but only one Geopark! In the subsoil, there are nearly three hundred volcanic cavities in the form of caves, grottoes and crevices. On the landscape, there are dry calderas, lakes in craters, fumarolic fields and hot springs. Underwater geothermal sources are found out at sea. The majestic mountain of Pico, whose cone is still intact, seems to protect all these geological riches. As a testimony to the power of nature, the archipelago’s volcanic history is impressive for the diversity of the region’s geological heritage that reflects a geological memory of 10 million years. The Azores Geopark Association has created new services, routes and interpretative products, implementing a high level of quality geotourism in the region, in close connection with other strands of Nature Tourism. To discover the underground world of the islands. To discover the strength of the volcanoes, enjoying the advantages of the spa waters and mud baths in terms of health, leisure and well-being. To better understand and interpret the volcanic phenomena. You can also combine the discovery of this amazing world of geotourism with an itinerary that includes the whole family! Start the day at a viewpoint from which you can admire the extraordinary landscape created by the Azores’ volcanoes. Then, go down into the subterranean depths of one of several cavities prepared for this purpose. They are magical places, suitable for even the smallest to visit. After returning to the surface, it’s always good to take a walk to enjoy the surrounding landscape. Whenever the heat rises, there’s nothing like a refreshing dip in a natural pool. A visit to a museum or interpretation centre will provide answers to any questions you have as a result of the rich experiences of a day spent in a world of volcanoes. With so many suggestions, you can’t help getting to know and enjoy the volcanoes of the Azores... an eruption of Flavours, Aromas and Experiences! - Only a limited number of caves and grottoes are open to the public, and exploring them should be accompanied by an expert guide and using proper equipment. There are local operators dedicated to caving. - Geotourism can be done throughout the year and most visitable cavities have a fixed opening schedule for part of the year. In the remaining months, it is possible to visit by appointment. - Changes in the weather must be taken into account, especially in the winter, so as to use the most suitable footpaths and viewpoints. - Wear hiking or climbing clothing and suitable footwear. - When entering a volcanic cavity, the visitor must be cautious and interfere as little as possible with the ecosystem. The main point is to see and enjoy. In order to preserve the gifts of Nature, there is a set of recommendations and prohibitions that must be respected.